Ad campaigns are an important marketing strategy for all kinds of businesses that want to increase brand awareness and profits. In this guide, you'll learn some key ad campaign basics along with tips to help you create, manage, and optimize more effective online ad campaigns. In this article, we'll be focusing on online advertising campaigns. Online ad campaigns are highly powerful because online activity is so measurable. The more data and metrics you can collect about the ways that people interact with your ads, the easier it is to optimize those ads to get better results for lower costs. Google AdWords is a paid search advertising platform that allows businesses to place sponsored ads in search engine results, as well as on the Google Display Network, in Gmail, on YouTube and other placements. Google search ads in particular can be highly particular, because search terms reveal a lot of intent: in other words, you can tell what a person wants by what words they use to search on Google. That allows you to create ad campaigns that really meet their needs. This is key, because AdWords rewards advertisers who create highly relevant ads with better ad rankings and lower costs. Learn more about how this ranking system, called Quality Score, works. To get started with creating an online ad campaign in AdWords, check out PPC University, a free learning resource for aspiring AdWords experts. Or learn how to advertise on Google in ten simple steps. Facebook is the most popular social network on the planet, with about 2 billion monthly active users! Not only does this represent a truly gigantic potential audience for your ad campaigns, but Facebook makes it possible to carve out and target very specific audiences with your ad campaigns. You can target your ads based on people's demographic, age, income level, interests, job title, political party, hobbies and much more. Facebook ad campaigns can also be highly cost-effective compared to other types of advertising. Learn more about advertising on Facebook. Most businesses choose to run multiple ad campaigns across multiple networks for the best results. Wherever you're creating your ad campaign, it's important to pay attention to your campaign structure. Ad campaigns should be organized according to business goals. You wouldn't want to mix ads intended to drive brand awareness with ads intended to drive sales, because these ads will need to be built very differently, and results and metrics for different ad types will look very different. One of the most important parts of setting up an online ad campaign is defining your audience: Who will see your ads? In paid search campaigns, this is achieved through keyword research, the process of discovering the real keywords that people are using to search for topics related to your business. You can then bid on those keywords so that your Google ads will show when people search for those topics. For example, if you're a plumber, you would want your online ads to show up when people search in Google using terms like "emergency plumber," "plumber near me," or "shower leak." The process is slightly different for Facebook ad campaigns; Facebook doesn't offer keyword targeting. Instead, you'll set up your ad campaigns to reach a particular audience, such as "moms under 30 who live in California." You can also create lookalike audiences (a way to find people that are similar to your current customers) or remarket on Facebook to people who have visited your website in the past. 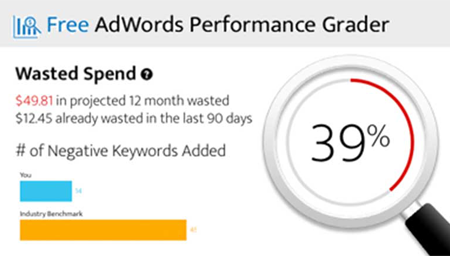 Here's an easy to way to do a "health check" on your AdWords campaigns: The AdWords Performance Grader is a free tool that analyzes your account and delivers a report showing where you're succeeding and where your ad campaigns need work. Ready to see how your ad campaigns are doing? Get your free report now. Need more help with online advertising? Here are some more ways we can help you succeed.